First of all, I would like to express my appreciation for your prayers and concern. I knew that my letters were sent to Christians in different parts of world, but I never imagined that I would receive letters, concrete gifts and even practical advice from them. I felt care and love in Christ. On the other hand, my letters seem to make my service and life open to many others. This realization makes me conscious and watchful of what I am doing in this field. Since last term I volunteered to visit kindergartens in different local mission stations of the Bible College of East Africa. My duty was observing the progress of the teaching, check bookkeeping, and finding areas to improve in each kindergarten. Finally, I made a report back to the headquarters at BCEA. There is a kindergarten located in a slum area called Ngomongo, and it takes only 30 minutes by foot from BCEA. I visit the place every Thursday afternoon. The other kindergartens in Maasai land are located far from Nairobi. For the visitation of these kindergartens, I had to travel at least twice a month during the weekend by car for hours, or sometimes by motorcycle into the mountain. In fact, it is tiring. In turn, the visitations provide more opportunities of exposure to local life and people than teaching in the BCEA compound. Along with the kindergartens in mission stations, I was given an assignment to check the work in churches in the stations. This requires checking the offering record, the number of church members, worship, church building conditions and so on, in each church. When needs arise for special occasions, I will need to know what is required. Generally pastors are very respectful and cooperative. But, frankly speaking, I find it quite delicate to check on ministries of the national pastors. The pastors, with many years of ministry experience and working knowledge of the language of people in the area (e.g. a pastor from the Luya tribe speaking the language of Maasai) might not always agree with a single female missionary with only a few years of experience in Kenya. Anyway, from the contacts I have ever had with them, I realize their significant role in co-laboring in each station. Many of the works were possible because of their service and support. 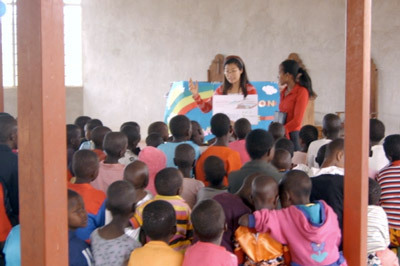 For example, in the vacation Bible school which took place this past August in each station, my part was to train teachers and to prepare programs and materials and the pastors were the ones who had to plan places for teachers to stay, mobilization of children, arrangement of transportation, and announcement to church members etc. Occasionally, I hear the pastors’ comments on missionaries that they have worked with in the past. They do not give positive comments on all missionaries. Surely those comments must be from their own views and expectations of what a missionary should be. Likewise missionaries have expectations for national pastors and subsequent comments on them. Over the last years in this field, I have learned things that were different from what I was used to and I am still learning more about their views and cultures. For example, things like keeping schedules, table manners and local food, hosting visitors, tea time, financial concepts, hierarchy, and even their expectations for missionaries, etc. This learning resulted in many changes in my expectation of national pastors. There are times when I encounter unpleasant issues in working with nationals. Personally, I find it hard because I tend to be emotional in times of disappointment at their cooperation. Then, I guess, my attitude is questionable. Well, I grew up in a Christian background with high respect for pastors. My mother used to prepare her best for a pastor if she wanted to give to that pastor. That was the way she expressed her respect for a servant of God. To have a pastor as a leader in church is not the same as to have pastors as your coworkers on the mission field or as your students in the classroom in BCEA, especially when you are in a position to require them to fulfill their work. However, when I face uncomfortable situations in working with national pastors, interestingly, my mother’s best for her pastor comes to my mind. I believe that attitude is a non-verbal expression which communicates more accurately than verbal expression. Then I ask myself about my attitude. Does mine communicate respect and care even in times of unpleasant issues? As far as I observe, the most common challenges among national pastors serving in remote areas in Kenya are things like financial support, education for children, or cultural issues which go against Christian teachings. I also hear from many graduates of BCEA about their struggle to look for teaching materials in their services. Even my experience of visiting pastors’ houses in Kenya reveals few teaching materials and books on their bookshelves. There must be many ways to help national pastors in this field. I view providing teaching materials and books for them to read and study as a meaningful help to them. Pray for a mature attitude toward my co-workers in my service for the Lord.